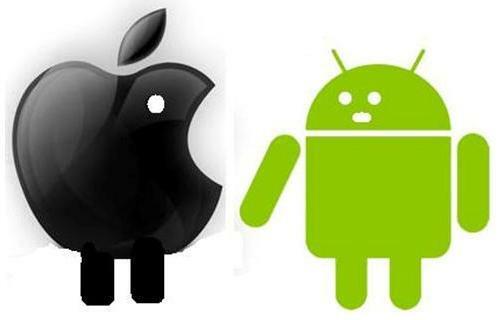 Now a days their is an War going between Android and iPhone Smartphone, both are best at their Level. Every User as his Need, Some Like Design, style, Apps, Camera and Much More. Making Decision while buying Smartphone is very difficult, Most of the Users goes for Android OS main reason is they are Cheaper then Apple. Now a days Android Smartphone starts at Rs. 6000/- and Apple iPhone Starts from Rs. 21,000/- Can you see the Huge difference. When comparing iPhone and Android smartphone hardware, Apple allow thier iOS to run only on iPhone such as iPhone 4, iPhone 4S, iPhone 5. while Google offer their Android OS to run on many Companies Like Samsung, Sony, HTC, Micromax and Many more because Android OS is an Open Source. Screen Size :- For instance, most Android displays are larger an the iPhone screen. Mostly Android Phones are 5 inches and iPhone are 4 inches and above. Display:- iPhone comes with Retina Display which has High resolution then Android Phone. Android Display are mostly LED, but iPhone display is Sharper then android display. Processor:- iPhone uses Apple designed A4 processor which is quite powerful then android which uses new generation of dual-core or quad-core processors. Connectivity:- iPhone Wi-Fi is more powerful then android, Bluetooth, accelerometers, proximity sensors, volume controls, headphone jacks and more are similar in both. Camera:- iPhone Camera is more powerful then Android, Specially Image Quality and iPhone has high resolution then Android. Storage:- Apple provides 8GB,16GB or 32GB of storage space, whereas Android phones provides 8GB to 32GB expandable (Micro SD Card). iPhone does not allow External Storage such as Memory card. Android has More Apps as compared to Apple Store. Since android is an open Source any developer can develop application to android Market. Most of the Apps in Android Market are Free but in apple store most popular apps are paid apps such as Whatsapp. Android Market has drawback, their are Hugh collection apps but some apps may or may not work on your android device because their are different types of android smartphones. Games :- Their are Huge Collections of Games on both stores, Apple store has most of the Games Paid but they come with high graphics and run smoothly whereas android Games are Mostly free. Flash :- Android devices are compatible with Adobe Flash, which enable user to view videos, animations and interactive websites on browser. The iPhone do not support Flash. Due to the Flash and different Hardware support the battery performance of android is very Low as compared to iPhone. Also android comes with big screen size which consumes more battery.